The increasing number of ageing aircraft, both in military and civilian sectors, has created a major challenge for airlines and airforces in terms of controlling life cycle costs and ensuring the safety of the fleet at the same time. In turn, there is a great need for practical and cost effective non-destructive inspection (NDI) techniques that can detect life-limiting flaws reliably. A major concern in ageing airframes is the development of fatigue cracks in fastener holes. These cracks in conjunction with corrosion can lead to multiple-site damage and cause catastrophic failure. Thus detection and measurement of cracks and corrosion are the focus of our activities in aluminum airframe structures. In composites, delamination and debonding due to fatigue, overloading or impact are considered important and are being evaluated. The reliable detection of fatigue cracks in critical engine components also remains a safety issue and essential for damage-tolerance based life cycle management. Thus, work is carried out to assess the reliability of inspection techniques and develop improved methods. Investigations cover a wide range of NDT methodologies including advanced ultrasonic methods, multi-frequency and pulsed eddy current procedures, micro-focused x-rays and enhanced optical techniques. These techniques are supported by advanced signal/image analysis software as well as probability of detection (POD) and confidence analysis, both developed in-house. This paper provides a brief review of NDI R&D activities carried out at IAR in support of ageing aircraft. Economical inspections of aircraft fuselage or wings require methods that can cover large areas. 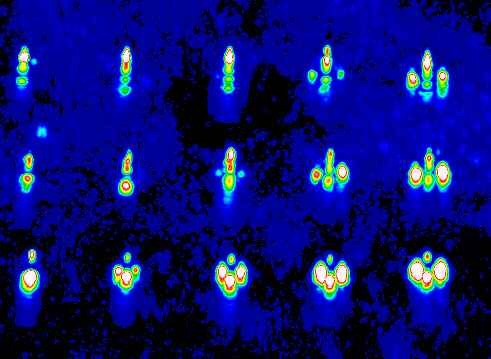 Ultrasonic techniques using guided waves have potential for large area inspection. Guided waves or Lamb waves are created in thin plates when oblique incident angles are used. These waves have a multimode character and are dispersive, that is their velocity varies as the function of the frequency-thickness product. Selection of modes can be optimised for a particular thickness of material by the calculation and analysis of dispersion curves1. Defects such as corrosion or disbond between two layers are seen as thickness change and therefore are detected. Practical application of this approach for large area aircraft inspections requires probes that will provide a good signal to noise ratio, and a stable scanning mechanism that will ensure a constant coupling of the probes. In a collaborative study with Tektrend International, several probe types and scanning configurations have been examined in the laboratory using simulated and real aircraft lap joint specimens. The easiest to implement is the pitch-catch configuration (Figure 1) that involves placing transducers on either side of the joint and scanning the transducer pair along the length of the joint. This is significantly faster than raster scanning methods. When there is no disbond or corrosion, most of the sound energy is transferred through the adhesive bond into the second layer resulting in a strong RF signal. However, when a disbond or corrosion exist between the two bonded layers, the transfer of energy is reduced and the signal intensity drops. Fig 1: Ultrasonic guided wave inspection of a lap joint in pitch catch configuration and corresponding signals for corroded and non-corroded areas (figure courtesy of Tektrend International). If conventional piezoelectric wedge probes are used for guided wave inspections, the overall signal amplitude can vary greatly due to the variation of the amount of the fluid used for transducer coupling, as well as probe alignment or the pressure applied. These problems can be resolved by using non-contact EMAT or air-coupled ultrasonic probes. EMAT and air-coupled probes have been used respectively at Tektrend2 and IAR3 for the detection of disbonds in simple lap joints and encouraging results have been obtained. Although the ultrasonic guided waves using either contact wedge probes or non-contact EMAT or air-coupled sensors have shown promising results in the laboratory for detecting corrosion or disbond in aluminium lap joints, their usefulness for field applications is yet to be demonstrated. Fig 2: A schematic illustration of the contact and immersion ultrasonic methods used to find cracks under fasteners. Ultrasonic surface waves are created in materials if the incident angle approaches the critical angle. Surface waves travel on and near the surface with a penetration depth of about 1 wavelength. Ultrasonic surface waves have shown good sensitivity to surface-breaking cracks4, therefore they were studied to determine their effectiveness for detecting fatigue cracks under rivet holes of lap joints. Both contact and immersion techniques, shown in Figure 2, were used with the purpose of establishing the optimal procedures and parameters. Figure 3 shows a riveted lap joint specimen with EDM notches and fatigue cracks of various sizes, and the corresponding immersion C-scan image is shown in Figure 4. The contact method was able to detect relatively small cracks (0.25-0.75 mm range) with a good probability of detection (Figure 5) although the POD was found to be dependent on the rivet type. This approach provides even better sensitivity than commercial eddy current equipment developed for this application. However, it can only be used for small area inspection as it is very labour intensive. Further work is planned in order to improve the inspection speed. 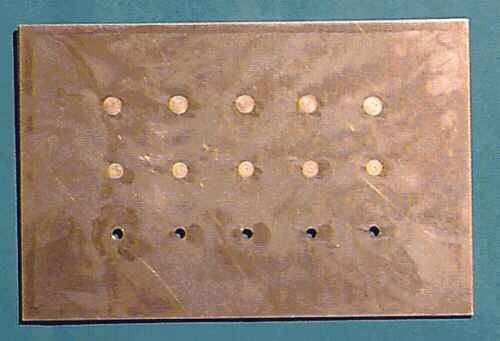 The results from the immersion technique, despite using an automated C-scan system, were not as good as the contact method for hidden cracks, mainly due to the scattering of the leaky waves at the rivet heads. Leaky waves have been used for detecting exfoliation or fatigue cracks in bolt holes of thicker aluminum plates as well as for bolt hole cracks in engine components. Fig 3: A lap joint specimen with EDM notches in holes and under rivets. Fig 4: An immersion C-scan image of the specimen of Figure 3 using ultrasonic surface waves. Fig 5: The probability of detection of cracks in riveted holes of the specimen of Figure 3 in contact configuration. Eddy current techniques are perhaps the most useful NDT approaches for ageing aircraft problems. They can be used for both corrosion and crack detection, although the two applications require different probes and settings. The probe geometry and the excitation frequency are the most important controllable parameters that determine the usefulness of the technique. For first layer corrosion detection in airframe, single frequency eddy current inspection is adequate with the frequency chosen high enough such that the induced current is concentrated in the first layer. In this case, thickness loss due to corrosion can be mapped without much interference from the air gap between the two layers. Fig 6: An eddy current image of a lap joint specimen scanned at 10kHz showing corrosion in the joint. Corrosion detection in the second layer, however, is more difficult due to the pillowing effect and varying air gap that produces a very similar impedance plane response to that from material loss due to corrosion. This problem has been addressed in the past with the use of dual frequency mixing methods6. In this approach, the eddy current probe is excited with two frequencies simultaneously and the results are combined either by subtraction or addition of responses at each frequency. The appropriate combination of dual frequency responses enhances defect signals by suppressing unwanted variables. Pulsed eddy current has also shown potential and is being studied along with single and multi-frequency eddy current techniques. A large linear scanner is available for imaging corrosion in lap joints using eddy current, an example is presented in Figure 6. Visual and enhanced visual NDT is performed to find surface topographical information such as dents, pillowing, surface breaking cracks, or other surface anomalies. When compared to conventional NDT methods such as eddy current and ultrasonics, visual inspections provide an advantage in speed and therefore are suitable for first line inspections to avoid longer downtime of aircraft usually needed for conventional NDT. Work at IAR in enhanced visual inspections involves D SightTM and Edge of Light techniques. The optical set-up for D-SightTM consists of a light source, a retro-reflective screen and the object being inspected (Figure 7). The surface being inspected must be reflective, however rough surfaces can be made reflective by the use of IAR's patented SolidHiTM technique or liquid highlighter. Fig 7: Double pass retroreflection (D Sight(tm)) optical set-up. The D SightTM effect can be explained using geometric optical principles. When a wavy surface is observed with this technique, the surface will either appear brighter or darker. The D SightTM process can be viewed as a slope detecting technique with positive surface slopes looking dark and negative slopes looking bright relative to the background. The images can be photographed or digitised and analysed with an image processor. D SightTM can be used to detect dents due to impact, or pillowing effects caused by corrosion. The Canadian Department of National Defence, US Air Force, FAA and Transport Canada joined Diffracto Ltd. and NRC in sponsoring development of a commercial D SightTM Aircraft Inspection Systems (DAIS). 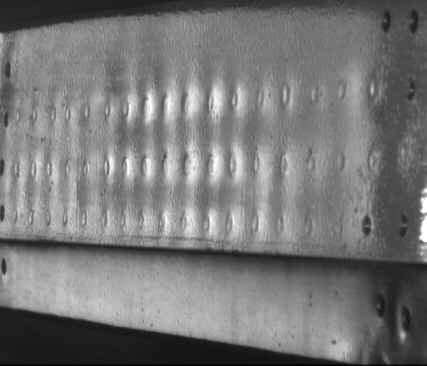 Figure 8 shows a D Sight image of an impact damage on a composite plate and Figure 9 provides a D Sight image of a lap joint with corrosion using the DAIS 250C instrument. Fig 8: A D Sight image of an impact damage site on a CF-18 vertical stabilizer. Fig 9: A D Sight(tm) image of an aluminium lap joint (cut out of a Boeing 727 aircraft) with corrosion in the middle. Fig 10: (a) Diffraction or "edge of light" zone. (b) Change of surface slope causes the edge of light zone to move with respect to the detector. Fig 11: An Edge of Light image of a Boeing 727 lap splice joint. Fig 12: X-ray image of a corroded specimen before and after image enhancement. Fig 13: A screen presentation using IAR's NDI Analysis software package. The EOLTM technique has recently been developed and patented at NRC and consists of a narrow light source and a detector held at a constant distance. A light source behind a slit is used to produce a rectangular band of light on the surface of the object to be scanned. In the main zone of the band, the intensity is almost constant but at the edges it drops off rapidly with distance due to diffraction effects (Figure 10). The detector of the EOLTM scanner is set up to operate in the middle of this "edge of light" zone of rapidly changing intensity. The detector is held at a constant position with respect to the light source and captures the light reflected off the surface. The intensity of the reflected light is constant when the surface is smooth. However, any surface features appearing in the edge of light zone changes the angle at which the light is reflected from the surface. This changes the position of the "edge of light" band in relation to the detector (Figure 10) changing the intensity of light captured by the detector. The EOLTM scanner performance can be optimised for a particular application by expanding or compressing the edge of light band, varying the angle of illumination, or changing the viewing angle. The scanner travels along the surface of interest providing a map of minute surface features such as deformation at crack tips or pillowing due to corrosion. Therefore, the EOL technique has potential for detecting surface cracks, corrosion in lap joints or general surface topography. The technique is relatively quick, and therefore is well suited for lap joint inspections, an example of which is provided in Figure 11. This technique was used in a probability of detection (POD) study involving several NDI techniques on J85 CAN 40 compressor discs. The results, shown in Table I, were better than those of widely used liquid penetrant (LPI) and magnetic particle (MPI) inspections but not as good as the eddy current techniques. X-radiography is based on differential absorption or scattering of x-rays due to differences in density or composition and variations in thickness of the part. The radiation passing through the part can be recorded on films or photosensitive papers, or viewed on a fluorescent screen, or monitored by various types of electromagnetic radiation detectors. Interpretation of radiographs is based on a comparison of the differences in photographic intensity with known characteristics of the object itself or with reference radiographs obtained from similar objects of acceptable quality. A method has been developed at IAR to measure thickness loss due to corrosion in the laboratory using x-radiography. The method uses a fine-grain film to record thickness variations in the corroded panel and in a calibration piece simultaneously. The calibration standard is basically an aluminum plate with a 25mm wide tapered slot in the centre. The slot is gradually machine-ramped from end to end and covers the thickness range to be measured. The image of the calibration ramp captured on film is used to produce a grey scale where intensity is proportional to change in thickness. 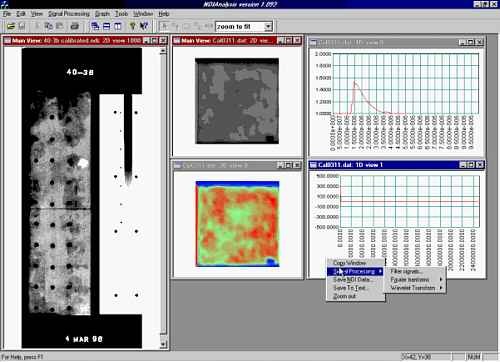 The images of the corroded plate (following corrosion removal process) and the reference ramp are then digitised with a x-ray film digitizer and analysed using IAR's NDI Analysis software (see section 6 below). After the image has been calibrated using calibration standard, it is colorised to assist in seeing the thickness changes (Figure 12). Multiple inspections are sometimes carried out for complete characterisation of complex components or to increase inspection reliability. A simple first pass technique, such as a visual or penetrant inspection are often used to indicate possible problem areas to be inspected with more sensitive techniques. The outcome of different inspections can provide complimentary information about the component under inspection. If the NDT data is stored on computer, the data can be analysed together using advanced signal processing and data fusion techniques in order to improve the final inspection results. Researchers at IAR have undertaken a project to develop routines such that all inspection data can be viewed and analysed using one software package. An example of screen presentation from different methods using the IAR's NDI Analysis software is shown in Figure 13. Life management of ageing aircraft and engines based on damage tolerance philosophy requires information on the detection limits of nondestructive inspection techniques. The NDI detection limit is established by measurement of probability of detection (POD) as a function of flaw size. One way of determining POD is to use actual parts that are known to contain flaws and perform an NDI demonstration using the inspection conditions employed in the field. This approach was used at IAR on J85 CAN 40 engine components using conventional as well as newer techniques10. The study showed that among the techniques investigated (Table I), automated eddy current procedures had the highest sensitivity and reliability in detecting low cycle fatigue (LCF) cracks in engine parts. This was indicated by the POD-crack size relationships and the crack sizes detectable at 90% POD with 95% confidence level. On the other hand, the widely used liquid penetrant and magnetic particle inspections were the least effective for this particular application. It was also found that the NDT response from artificial cracks is quite different from that of service-induced cracks due to shape, surface texture and tightness. Therefore, for realistic POD measurements, actual parts with real service-induced cracks should be used if possible. A summary of NDT results from inspection of bolt-holes of J85 CAN 40 compressor disks for fatigue cracks. There is a great need for the development of cost-effective and reliable non-destructive testing techniques that can be used to ensure the safe operation of ageing aircraft. Visual and enhanced visual methods such as D Sight and Edge of Light are suitable as first line inspections to show surface abnormalities that could be indicative of hidden corrosion, impact damage or cracks. Conventional NDT methods such as ultrasonic, eddy current and radiography are needed to indicate the precise location of damage and to characterise in terms of size or severity. Each technique has certain advantages and limitations and often more than one technique is needed to cover different flaw types or applications. Enhanced visual, advanced ultrasonic, eddy current and x-ray methods have been developed at IAR in support of ageing aircraft. These techniques, along with multi-mode NDI Analysis software and reliability assessment procedures developed in-house, have been used to address corrosion, impact damage, debonding and fatigue cracking associated with ageing aircraft. The authors would like to acknowledge contributions of the staff of the IAR Structures, Materials and Propulsion Laboratory and the financial support of the National Research Council and the Department of National Defence. J. L. Rose, K. Rajana and A. Pilrski, Ultrasonic Guided Waves for NDE of Adhesively Bonded Joints in Aging Aircraft, The Adhesion Society, 1994, pp. 272-275. V. Mustafa, A. Chabaz, D. R. Hay, J. Gauthier, K. McRae, A. Fahr, and D. S. Forsyth, Advanced NDI Techniques for Corrosion Detection of Aging Aircraft Structures, 1997 USAF Aircraft Structural Integrity Program Conference, San Antonio, December 2-4 1997. D. W. Schindel, D. S. Forsyth, D. A. Hutchins and A. Fahr, Air-coupled Ultrasonic NDE of Bonded Aluminum Lap-joints, Ultrasonics, vol. 35, no.1, pp. 1-6, February 1997. A. Fahr et al., Surface Acoustic Wave Studies of Surface Cracks in Ceramics, Review of Progress in Quantitative Nondestructive Evaluation, University of California, Santa Cruz, 1983. K. I. McRae, Ultrasonic Imaging of Fatigue Cracks Under Fasteners, Canadian Aeronautics and Space Journal, Vol. 43, No. 1, March 1997. J. G. Thompson, Second Layer Corrosion Detection Using Dual Frequency Eddy Current Techniques, American Transport Association NDT Forum, Cincinnati, Ohio, August 25-27, 1992. Gould, Ronald W., Komorowski, Jerzy P. Method for Preparing Solid Surfaces for Inspection, United States Patent, 5,569,342, Oct. 29, 1996. J. P. Komorowski, D. L. Simpson, R. W. Gould, A Technique for Rapid Impact Damage Detection with Implication for Composite Aircraft Structures, Composites, 1990, pp. 169-173. D. S. Forsyth, J.P. Komorowski, A. Marincak, R. W. Gould, The Edge of Light Enhanced Optical NDI Technique, Canadian Aeronautics and Space Journal, Vol. 43, No.4, December 1997, pp. 231-235. A. Fahr and D.S. Forsyth, Results of a Round Robin Inspection Reliability Study, Canadian Aeronautics and Space Journal, Vol. 43, No. 1, March 1997, pp. 6-10.